NYC, 02/15/2019, 12:45PM. 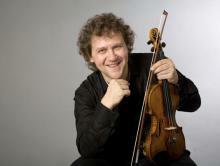 Concertmaster of the Royal Concertgebouw Orchestra. Violonist Vesko Eschkenazy has performed as soloist with the Royal Concertgebouw Orchestra, London Philharmonic Orchestra, English Chamber Orchestra, Monte Carlo Philharmonic, Sofia Philharmonic Orchestra, Mexico City Symphony, the Netherlands Philharmonic Orchestra, Prague Symphony Orchestra, National Symphony Orchestra of Ireland, Bach Chamber Orchestra – Berlin to name a few. He has taken part in concerts alongside Montserrat Caballe, Placido Domingo, Alexis Weissenberg, Yuri Bashmet, and Mstislav Rostropovich and has played under the direction of Mariss Jansons, Bernard Haitink, Riccardo Chailly, Kurt Masur, Sir Colin Davis, Carlo-Maria Giulini, Seiji Ozawa, and Emil Tchakarov.